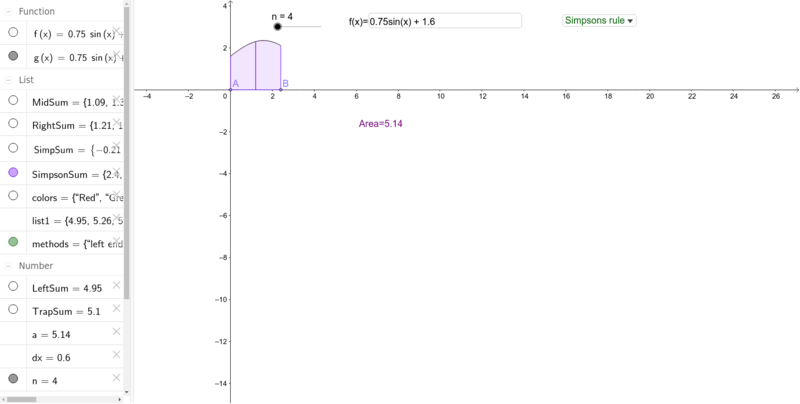 This Geogebra file calculates the area under a curve. Use this file to solve questions in Exercise 2C of Cambridge HSC Mathematics General 1. To use this file: - set n to 4 (number of partitions); - vary points A and B for the Base line of the Simpson's Rule; - vary the distance of the first line (df) by varying the constant (value after the function); - vary the irregular boundary by choosing a function for the curve (sin, cos and tan). The distance of the last line is set by the function.